Conquest of the New World is a computer game produced by Interplay Entertainment in the mid-1990s. The game is a strategy game, involving single player playing, or multi-player playing either by hotseat, on LAN, modem, or even PBEM (play-by-email). The game is set in the year 1493, and deals with the discovery and conquest of the Americas. 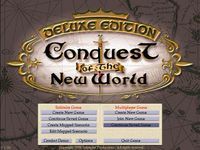 A deluxe version of the game was released in 1997 Conquest was an innovative game. Considered a leap forward in gaming when it was published in 1996; Interplay had managed to combine top-notch graphics, sound, and gameplay with a detailed historical framework to create a title that was both addictive and entertaining. Players move their various pieces (including explorers, colonists, and soldiers) through a blacked-out world, uncovering mountains, plains, and rivers. Landmarks are named by the first player to discover them. After mapping out some of the local terrain, players must build a colony and make it self-sufficient; to this end, players can build sawmills, metal mines, housing, and farms to generate the resources and space necessary to expand, and eventually, build more colonies. Lastly, players must proclaim their independence and conquer the other colonists. The player controls one of 6 different nations (five European and the High Natives) in their attempt to colonize and conquer a "new" continent. The game is turn-based, and combat is a mini-game taking place on a 3x5 square battlefield where victory can be achieved by killing all enemy troops or capturing the enemy's flag. The gameworld is represented in an isometric point of view with three-dimensional terrain features. Colonies consist of a Colony Centre, exerting an area of control within which all buildings must be placed. Most buildings, including the Colony Centre, can be upgraded, adding to their production capabilities. Resources are used for construction and trading. Victory conditions are customizable, so the game can be played as a pure conquest game with the last nation standing, being the winner, or as a more peaceful race for victory points to a pre-determined score. Source: Wikipedia, Conquest of the New World , available under the CC-BY-SA License.